Our family at Rusty Eck Ford salutes all of the men and women of the military who serve, or have served, for our country. We remember those who have fallen for our freedom, and the families who have sacrificed as well for our peace of mind, pride, and security. Thank you for all you have done, and continue to do each day, selflessly for our freedom. 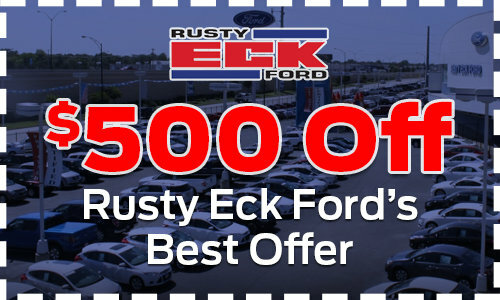 To show our thanks, we would like to help you save on your next new Ford here at Rusty Eck Ford. Along with our Military Appreciation Rebate of $500, we would like to pass on additional savings to those serving, veterans, and their family members when you purchase your Ford from our family at Rusty Eck Ford. How do I qualify for the Military Appreciaton Rebate? Simply go to www.fordsalutesthosewhoserve.com and complete the information requested. Print out your certificate, and bring it with you to Rusty Eck Ford. Pick out your vehicle, and use your certificate for an additional $500 savings.